As night falls on the Areia Homestead Project, forty kilometers from the town of Trairão, in the western portion of Pará state, the silence is cut short by the roar of approaching motorcycles. Armed men wearing hoods to conceal their identities ride up and circle Osvalinda and Daniel Pereira’s home. The couple grows fruit for a living, but now they have a price on their heads for not cooperating with illegal loggers who have ordered them out of their remote Amazon home. They’ve faced escalating threats since 2012. 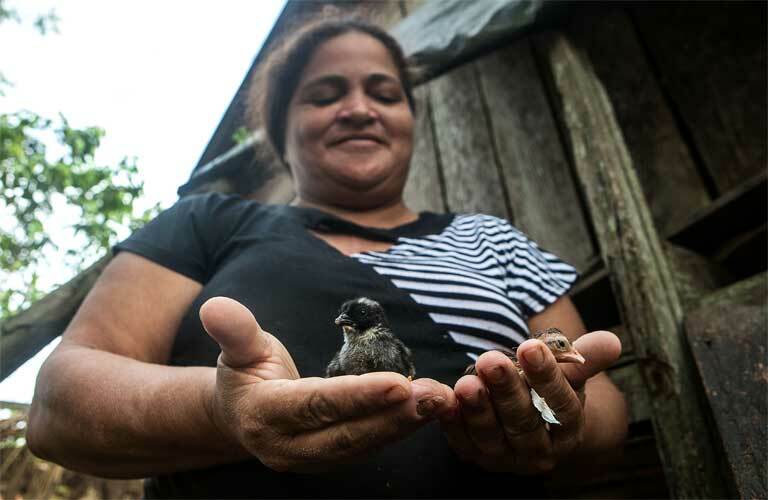 Osvalinda and Daniel, along with Antônio Silva, another farmer, were included in a federal homesteading program that aims to protect human rights activists, and in theory, should guarantee them protection. However, in practice, security is lacking. Scared neighbors have also kept their distance, leaving the three outspoken farmers and activists even more isolated. “It’s not easy to live in a place where you go looking for safety and can’t find it,” agrees husband Daniel. The conflict between homestead farmers and illegal loggers has only worsened as plans have advanced for the construction of the region’s São Luiz do Tapajós hydropower plant, budgeted at US$ 8.9 billion. Even as pressures build on local homesteaders, the future of the São Luiz do Tapajós dam remains in doubt — victim to the political chaos now enveloping Brasilia. The environmental licensing for that hydropower plant on the Tapajós River (one of the richest watersheds in terms of Amazonian flora and fauna) was suspended on April 19, 2016 by IBAMA, the federal government’s environmental agency. But that decision could be reversed by the new government of interim Brazilian President Michel Temer, whose administration replaced that of impeached President Dilma Rousseff in May. IBAMA’s decision to cancel the dam’s license — made in the waning days of the Rousseff administration — was triggered by a decision by FUNAI, (the federal body responsible for indigenous affairs), to initiate demarcation of the Sawré Maybu indigenous territory claimed by the Munduruku, who inhabit the area to be flooded by the dam’s reservoir. The Brazilian constitution and Convention 169 of the International Labor Organization (ILO), to which Brazil is a signatory, guarantee the rights of first nations to their traditional lands, and oblige the Brazilian state to conduct prior consultation and to discuss projects that might impact indigenous people. FUNAI completed the studies needed to begin the Sawré Maybu demarcation two years ago, but the agency had failed to act until now, possibly because the hydro plant was considered a priority infrastructure project by the Rousseff government. In a confidential statement to Repórter Brasil, an expert source concerning native affairs said that FUNAI’s sudden action on Sawré Maybu demarcation, and IBAMA’s cancelation of the dam’s license, were both calculated to cause trouble for Temer’s interim government, which would find itself supporting construction of a highly controversial hydroelectric plant likely to bring irreparable harm to the Munduruku people. At the same time, the rushed FUNAI / IBAMA decisions seemed intended to appease social movements who long complained of the indifference of the Rousseff administration toward indigenous causes. Now that Temer’s interim administration has taken over, there is likely to be a profound change in the top officials at both FUNAI and IBAMA, while the demarcation of new indigenous territory will ultimately depend on the political good will of the federal government. All of these rapidly unfolding events would seem to indicate that the São Luiz do Tapajós dam is far from dead. In actuality, a whole set of projects — dams, waterways, river ports, railways, and highways — are planned that could transform western Pará, turning it from a remote Amazon region to a commodities transportation hub. The São Luiz do Tapajós dam is only the starting point for the Tapajós Complex: a mega-project aimed at creating a far-reaching industrial waterway that would begin in the western state of Mato Grosso, and run past proposed dams on the Teles Pires River, a Tapajós tributary. This proposed inland waterway would facilitate the shipping of grain, soy and other commodities grown deep in Brazil’s interior to a river port in Santarém, and then on down the Amazon to the coast for international export. Completion of the Nicaragua Canal could add to this grand plan, allowing for the shipping of Brazilian crops to China. The completion of highway BR 163, running through the west of Pará, along with a railway still in its incubation stage, but already nicknamed the “Grain-Train”, are other infrastructure projects that agro-businessmen are hoping will optimize commodity transport logistics and earn big profits. The selection of Senator Blairo Maggi as Agriculture Minister by the new Temer government could possibly bode well for this sweeping infrastructure endeavor, say Brazil watchers. The former governor of Mato Grosso state owns a controlling interest in the Amaggi group, a large company that produces, harvests and exports soybeans. Another of Maggi’s companies provides infrastructure for the soy sector, building terminals, highways and waterways. The Tapajós basin infrastructure projects would bring the promise of progress, and the creation of new jobs to the now remote region. However, environmentalists, small family farmers, social activists, and Indigenous groups are very concerned over the socio-environmental impacts that such rapid development will bring to the basin — including an intensification of illegal logging and land grabbing. Each homesteader’s lot in western Pará can measure up to 100 hectares — 1 square kilometer (about 0.4 square mile). But those little family farm homesteads, which once seemed secure, are now under pressure from intensely invasive activity — the appropriation of land through violence and fraud. “The stress on the farmers is the result of a concentration of squatters and conflicts with loggers,” states Carolina Motoki, a researcher with the Integrated Action Network for Combatting Slavery (RAICE). The case of the Areia Homestead Project is emblematic. A survey by the Pastoral Land Commission (CPT) — an entity linked to the Catholic Church that assists farmers — shows that 93 out of 286 homestead lots have already been abandoned there, with just one illegal squatter now claiming a total of 22 lots. “The squatters grab land through violence and then try to legalize this fraud through various means,” explains Maurício Torres, a social scientist and expert on Amazon socio-environmental matters. A network of illegal loggers is using the homestead projects to confer “legitimacy” to their illicit cutting of trees in protected areas. The loggers claim homestead lands to be the source of illegally harvested timber to trick government enforcers. “In order to transport the logs, a transportation guide must be used, [over which] there is heavy [government] oversight,” explains Motoki. “So, the loggers take advantage of the management of the areas legalized as homesteads to ‘cook’ the transportation papers of the logs stolen [from protected forest areas].” The illegal loggers also use homestead roads for their logging trucks. Farmers that don’t go along with these schemes put their lives at risk. Such is the case with Osvalinda and Daniel Pereira, and Antônio Silva. The hard work of the homesteaders and the lack of basic public services and law enforcement in the west of Pará, help facilitate the logger’s illegal activities. The homesteaders “fill a gap left by the State — building roads, sometimes [constructing] schools, and offering job opportunities. The homesteaders’ roads are the entryway into the forest, and this is of interest to the loggers,” says Motoki. At the peak of the logging season, dozens of trucks loaded with saw logs circulate through the Areia Homestead Project on a daily basis. The most sought after timber comes from the ipê tree. Cut and ready for export, it can go for US $1,750 per cubic meter. A truckload generally carries 30 cubic meters of unprocessed logs. Taking into account raw material lost to the sawing process, each truckload is worth approximately US $29,000. Toreiros — log-runners — are responsible for recruiting workers and organizing logistics. Poor peasants make up the base of the pyramid of this illegal business, and they carry out the most at-risk activities, such as chainsaw operation. “What’s more, when the federal authorities carry out their oversight operations, these [peasants] are the ones who go to jail,” explains Motoki. In August 2015, a Federal Police sting code-named “Clean Timber” arrested a gang of businessmen and public agents from federal and state bodies who were illegally harvesting wood from the Amazon. According to the investigation, homestead farmers were forced to participate in the criminal scheme in order to continue receiving social program benefits, such as food stamps. “A large part of the illegal timber harvesting goes downriver to Belém [the coastal capital of the state of Pará], and part of it is exported,” explains Olavo Pimentel, a deputy with the Federal Police. If the São Luiz do Tapajós hydropower plant goes ahead, its reservoir will flood traditional riverside communities and indigenous villages. Its 6,133-megawatt generating capacity would provide enough electricity to power up to 20 million homes, according to Eletrobras, the Brazilian state company that is heading up the consortium of firms interested in receiving the dam concession. French groups EDF and GDF Suez are among the possible Eletrobras partners for the undertaking. The perilous future that could befall the small Tapajós River municipalities, should the dam’s construction go forward, is reflected in the recent experiences of the residents of Altamira, located near the spot where the controversial Belo Monte hydropower plant was recently erected on the Xingu river, also in the state of Pará. “As [dam] construction made progress in Altamira, there was large urban deterioration, with an increase in violence and city sprawl, as well as rural decay, with increases in squatting and illegal logging. In Tapajós, this will also happen. It is inevitable,” predicts deputy Pimental. He explains that his tiny police force cannot possibly quell growing lawlessness. A vast area of western Pará falls under his jurisdiction — three times the size of the state of Florida — all of which he and a staff of less than 60 policemen, specialists, technicians, and assistants are expected to patrol. “On the one hand, the hydropower plant brings progress. On the other, it attracts people interested in illegal logging. It is inevitable. But the overseeing bodies have to be prepared for more intense [criminal] activity,” Pimental asserts. When asked about the identity of the criminal groups causing the destruction of the surrounding forest, he doesn’t answer. Back at the Areia Homestead Project, farmer Osvalinda reports that opportunistic intruders from other Brazilian states are arriving in growing numbers. The hydropower plant will most likely only increase these pressures, and Osvalinda fears escalating attacks from illegal loggers. “There will be a greater demand for timber due to the dam’s construction,” she foresees. 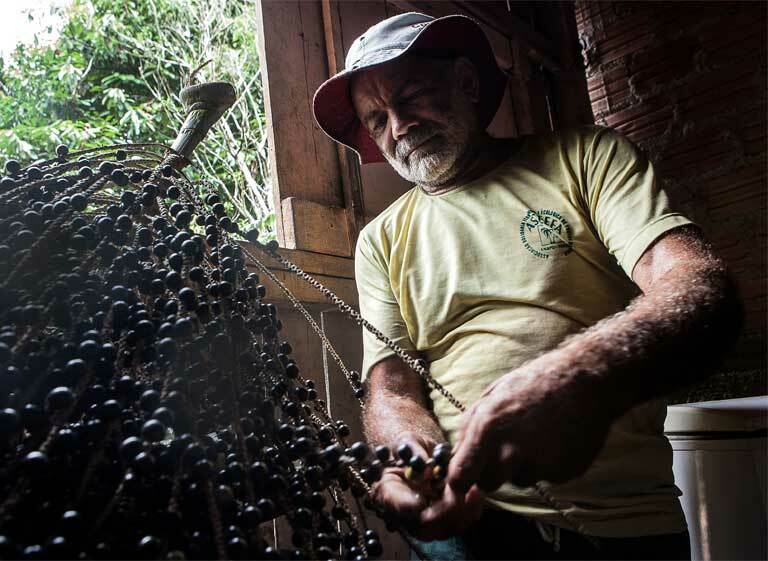 Antônio Silva, who even at 64 is still able to climb tall trees in just seconds, has already lived through many conflicts. He fought with would-be Amazon ranchers who “put prices on the heads of anyone who planted crops.” He faced down the hostile threats of gold prospectors in Serra Pelada, in southwestern Pará during the 1980s. But he has grown tired of the disputes with loggers. “I’ve been around a lot of places: Piauí, Maranhão, Pará, Mato Grosso. Nowadays I just try to keep to myself,” he states. He resents being abandoned by his neighbors, some of whom have believed the malicious rumors about the homesteaders spread by the loggers. A local priest, Father João worries that that the homesteaders are underestimating the danger they are in. “Generally speaking, the homesteaders don’t understand that they are threatened. They are all at risk because of the dam and it will just get worse,” says the priest, who represents the Pastoral Land Commission of Itaituba, the municipality where the bulk of the impact will be concentrated if the São Luis do Tapajós power plant is built. The priest’s main worry is that the coming of the dam will ultimately cause small farmers and landholders to be driven off their lands by militias so that the home lots can be sold at a high price to other settlers at a later time.